Like the pigs, but better! And spicier. I spent the long weekend in Tahoe, where my friends and I put away a truly obscene quantity of German sausages at Himmel Haus, so how I can even stand to look at these photos is beyond me. Maybe it helps that I didn't also stuff schnitzel in blankets? Did you know how many variations on pigs in blankets there are? I did a quick google search to check if I'm even allowed to suggest my sausages here are "in blankets" because I was pretty sure that could mean pancakes as well as croissant dough, but I wasn't 100% on that. Turns out, yes, the "blankets" are sometimes pancakes too, but I was not prepared for the endless variations world wide on this dish. In the US "pigs in blankets" is usually hot dogs wrapped in croissant rolls. I think we've all seen these, yes? But apparently it's also ok to use biscuit dough or pancakes (phew! ), and the "pig" can be Vienna sausages, cocktail sausages, or breakfast sausage. I have an aversion to Vienna sausages since eating them for almost every lunch for a year in first grade. Cold, out of the can. With that gross jelly still on them. But the rest are ok.
Germans use sausage wrapped in puff pastry, and call it, wonderfully, Würstchen im Schlafrock, which means "sausage in a dressing gown." That may more accurately describe the situation I've got going on here, with their little belted waists. The Danes sell them out of "sausage wagons" and the American style is called "sausage horns." Alrighty. In Mexico they use tortillas and deep fry it. I can definitely get on board with that. The Brits, smarter than all of us, dispense with any extra carbs and just wrap their sausages in bacon to party with pork on pork. Horrifyingly, Israelis cover puff pastry with ketchup before rolling and baking, and I can't get over what a soggy mess that must be. I guess it's appropriate then that the dish name, Moshe Ba'Teiva, translates to "Moses in the ark." And as for me, I swapped out the hot dogs for merguez, my favorite spiced lamb sausage, and wrapped it in the most delicate, buttery, yeasty pancakes I know how to make. For good measure, I drizzled the whole pile with a simple sauce of butter + honey, and the result is a delightfully messy, delicious finger food snack perfect for your next breakfast hour cocktail party (aka brunch). Or, if you don't want to wait for the excuse of company, you could just make these and hoard them for yourself. Sometimes not sharing is self-caring. 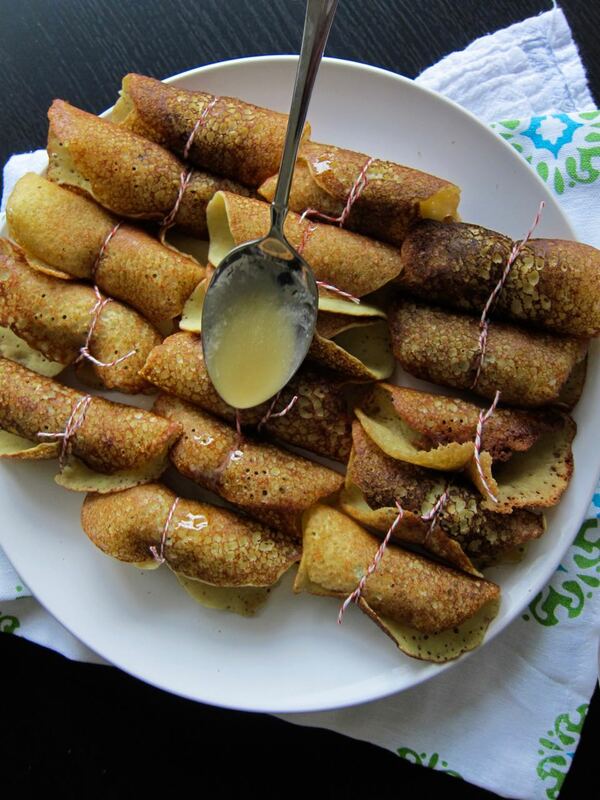 Pancakes adapted from Julia Moskin via Mourad Lahlou. They are a little extra work, yes, but trust me, the flavor is worth it. Plus, you can make the batter in advance. Makes a pile. I had plenty of leftover pancakes, so the more sausage you use, the more Lambs in Blankets you get! Or, make half the batter. Combine yeast and sugar in a bowl, stir in 1/4 cup warm water and let rest 10 minutes until foaming. In another bowl, whisk together the three flours, salt and turmeric and set aside. In another small bowl, combine baking powder and 3 tbs warm water and stir to dissolve. Pour into a blender and add 1 1/2 cup warm water, the milk, and the yeast mixture. Blend on low to combine, then as the blender runs, gradually add the flour mixture. Pour the batter in a bowl, cover with a towel, and let rest 1 1/2 hours or until doubled in size. Either use right away or refrigerate overnight. When ready to cook, heat oven to 250 degrees and heat a skillet over medium high. Cook sausages until well browned and cooked through. Drain on paper towels, then transfer to foil lined baking sheet and keep warm in oven. Make the pancakes. Stir the batter to deflate. Heat a non-stick or well-seasoned cast iron skillet over medium heat. Melt a little clarified butter in the pan (if needed) and pour 1/8 cup batter into the pan, and cook about 3 minutes, unitl top is covered with holes and set. Repeat with remaining batter, as many as a time as you can manage without crowding the pan. Keep warm between kitchen towels on a baking sheet while finishing cooking. Assemble the lambs in blankets: cut each sausage into 4 small pieces (or into roughly 1-2 inch pieces) and roll in a pancake. Tie with kitchen twine or spear with a toothpick to close. Combine butter and honey in a microwave save bowl and heat until hot and pourable, 15 seconds at a time. Stir, then drizzle over the lambs in blankets. Serve immediately.